Istanbul municipality responded to “GAY” license plate tweet: So what if we are gay? The Atasehir Municipality in Istanbul responded to a viral tweet about the license plate of a municipality police vehicle with a popular pride slogan. The municipality told kaosGL.org that they are ready to give all sorts of support for LGBT people. 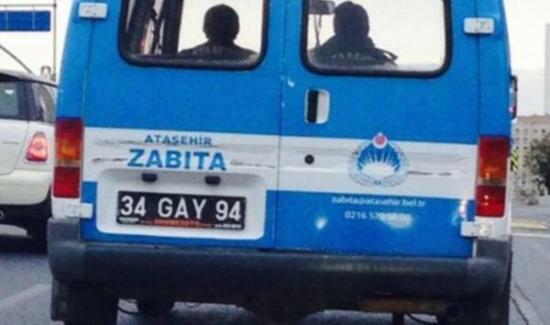 The Atasehir Municipality in Istanbul, which belongs to the main opposition Republican People’s Party (CHP), responded to a tweet about the “34 GAY 94” license plate of a municipality police vehicle without falling into the trap of homophobia. In November, Besiktas and Sisli municipalities in Istanbul stood up against transphobia on the Trans Day of Remembrance, putting up billboards with LGBTI activists holding banners that read “just to spite hate, long live life”. The Besiktas Municipality has also begun offering free healthcare to a trans shelter.